Oil prices and credit worries sank the driller last month. What: December was yet another brutal month for Whiting Petroleum (NYSE:WLL), which endured another devastating plunge. Following last month's plunge, the driller ended the year down 71.6%. So what: Whiting Petroleum's latest slump was primarily fueled by the price of oil, which slumped another 11% last month and was down 30% for the year to just over $37 per barrel. That price is well below the company's cash flow break-even point, which for 2016 is $50 per barrel. With a growing distance between the current oil price and Whiting's cash flow break-even point, it suggests that the company will need to use debt to fund the difference. That's a concern because it already has an elevated debt level, which is one of the reasons why the company was recently put on review by its rating agency for a potential credit rating downgrade. 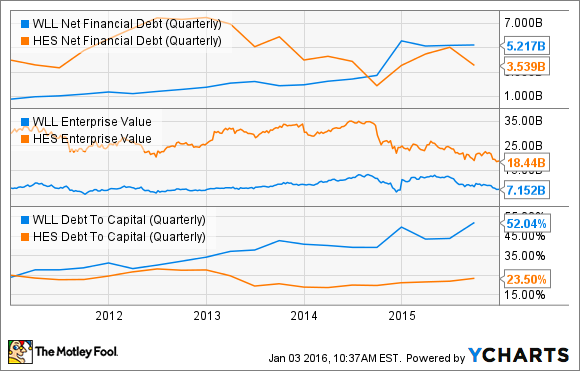 WLL Net Financial Debt (Quarterly) data by YCharts. While Hess was also put on review, it is in a much better financial position after it sold half of its Bakken midstream business. That sale will bring Hess' net debt-to-capitalization rate down to 13%, which is the lowest in its peer group. Suffice it to say, a credit downgrade wouldn't matter much to Hess because its leverage is already very low. Furthermore, with plenty of cash on the balance sheet, Hess won't need to use debt to balance cash flow with capex should oil prices continue to slide. Now what: Whiting needs oil prices to move higher in 2016 or it runs the risk of seeing its financial position further deteriorate. It's clearly in a tight spot right now because it doesn't have a whole lot of options other than selling assets. While it has assets to sell, it lacks the large stable midstream business that Hess was able to sell for a premium valuation. Needless to say, the company's stock price could continue to remain weak until oil shows signs of heading back over $50 a barrel.